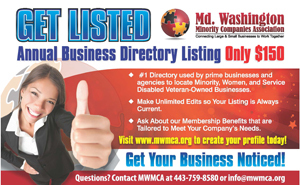 Washington Suburban Sanitary Commission's (WSSC) Small, Local and Minority Business Enterprise (SLMBE) Office, we would like to inform you of the solicitations for contract opportunities. To obtain more information about these solicitations please visit our WSSC Supplier Portal System at the following URL: https://www.wsscwater.com/contracts Please note ALL questions related to the solicitations must be addressed to WSSC’s Buyer(s). Please register in our WSSC Supplier Portal System TODAY to ensure that you receive official email notifications when we are soliciting for services that are within your business' capabilities and classification(s). Please click on the following web link to register TODAY and learn about opportunities with WSSC: www.wsscwater.com/supplier. In order to view or download bid opportunities you must be registered on the Supplier Portal System.